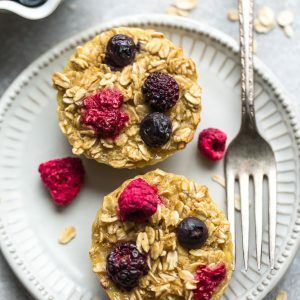 Baked oatmeal cups - the perfect healthy make-ahead breakfast for busy mornings. Best of all, includes 10 different flavors to prep ahead and stock your freezer. Refined sugar free, gluten free and vegan. In a large bowl, mix the flax seeds and water to make the flax egg. Set aside until thickened (about 2 minutes) (Skip if using regular egg). After 2 minutes, whisk in milk, maple syrup, coconut oil, vanilla, baking powder, cinnamon, salt and fold in the oats. Stir in almond butter and mashed banana. Divide batter evenly into prepared muffin tin or silicone muffin liners. Top each serving with sliced bananas. Stir in the additional 1/4 teaspoon of cinnamon, applesauce, and chopped apples. Divide batter evenly into prepared muffin tin or silicone muffin liners. Top with more sliced apples, if desired. Enjoy immediately or freeze in a freezer-safe bag or container for up to 3 months. Reheat in the microwave when ready to enjoy. Stir in applesauce, nutmeg, carrots, and coconut. Fold in raisins and nuts. Divide batter evenly into prepared muffin tin or silicone muffin liners. Sprinkle with additional coconut, raisins, and pecans, if desired. Stir in the honey (leave out the maple syrup from the base recipe) and nuts. Stir in the lemon juice, lemon zest, almond extract and poppy seeds. Divide batter evenly into prepared muffin tin or silicone muffin liners. Press tops with sliced almonds. Stir in the pineapple and shredded coconut. Divide batter evenly into prepared muffin tin or silicone muffin liners. Sprinkle tops with coconut chips, if desired. (optional). Stir in canned pumpkin, pumpkin seeds, and cranberries. Divide batter evenly into prepared muffin tin or silicone muffin liners. Press additional pumpkin seeds and cranberries on top, if desired. Bake in preheated oven for 20-25 minutes, or until set. Stir in chopped fresh raspberries, freeze-dried raspberries, and chocolate chips. Divide batter evenly into prepared muffin tin or silicone muffin liners. Press additional chocolate chips and freeze-dried raspberries, if desired. Allow to cool in the pan for 10 minutes before removing from tin. Stir in chopped strawberries and freeze-dried strawberries. Divide batter evenly into prepared muffin tin or silicone muffin liners. Top with more freeze-dried strawberry slices, if desired.